William Richard Behrend, Jr., 50, Raymore, Missouri passed away January 26, 2019. Memorial services will be held at 2:00PM, Saturday, February 16th, 2019 at South Haven Baptist Church, Belton, Missouri. Mr. Behrend, Jr. was born September 19, 1968 in La Crosse, Wisconsin. Rick attended Devry Institute to become an automotive technician. He worked at Dodge dealerships and Dodge was his specialty. In 1989 Rick welcomed his first son and in 2004 married Bernadette and had 2 children together. Rick started Behrend’s Auto in 2002 and has ran it successfully to this day. He graduated from the MCC Blue River Police Academy with honors in 2003. 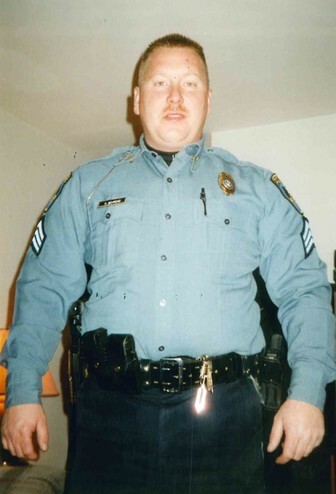 He balanced two careers at the same time working at the auto shop and working for the police force. Rick was very knowledgeable and mechanically inclined to fix and diagnose anything. Survivors include his parents Bill and Barbara Behrend, wife Bernadette Behrend, children Jacob Behrend, Jessica Behrend, and Brandon (Grace) Farwell, grandson Edward, sister Diane (Kevin) Potenziani, brother Michael (Trisha) Behrend, and many other family and friends. In lieu of flowers, donations can be made to the William Behrend, Jr. Memorial Fund in the care of Bernadette Behrend. I’m so sorry for your loss. Keeping you in prayer. My heart breaks for you and your family. You are in my thoughts and prayers. Rick will be truly missed. I’m so sorry for your loss Berna words can’t even express I will keep you and your family in my prayers daily you call me when you’re ready I love you all! Ricky was a good man and a great father. He loved his family more than anything in life. I have no doubt that his hand will forever be on you and his children’s shoulders guiding you through your lives. I love you more than you know and I will forever be there for you and the kids. Bernadette, so sorry for you and your family. We love you and you will be in our hearts and thoughts. Y’all family are in my prayers my heart goes out to all of yall my seepest and condolence goes to your family!!!!! SORRY FOR YOUR LOSS BARBARA AND BILL AND FAMILY MAY YOUR SON RIP???????????????????????????????????????????????????????????????????????????????? Brother Bill and Sister Barbara. Elizabeth and I will not be able to attend Bill Jr’s service but please know that your families will be in our prayers. We know God holds you all in His hands. Berna and family…. so very sorry for your loss. You are all in my thoughts and prayers. I hope all the good memories help you through this most difficult time. Gone but not forgotten…your legacy lives on Mr. Behrend. In your strong and beautiful wife and in your wonderful children and grandchildren. To Bernadette & Family, We are so sorry to hear of your loss. It was a wonderful experience to know you and your husband. He will truly be missed.Thanks for all you both have done for us..